In this lesson, we will learn about graphing quadratic equations. Learn how to graph quadratic equations. See how we can graph the equation when the x-coordinates of the graph are given (1st math video). 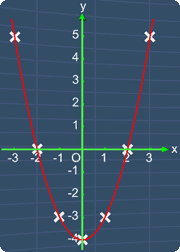 See how we can graph the equation when the x-coordinates are not given (2nd math video). Where a, b and c are the coefficients of each term respectively. Depending on the value of a, a quadratic graph may have a 'U' shape or a '∩' shape. Draw a x-y table to store the coordinates of all the points. It is better to have at least 7 points to get a good idea on how the graph looks like. Practice as many times as you can when drawing the graph, so that the curve will look smooth and steady. The math videos below will show you the steps to graph any quadratic equations. This lesson will show the basics behind graphing quadratic equations. Consider this quadratic equation, y = x^2 -4. Now, from this table, we can see that all the x-coordinates are given. To graph the equation, we can use these x-coordinates to find all the y-coordinates. After doing so, we will have the coordinates of seven points that can be used to graph the equation. Let's start. When x is -3, we can substitute x in this equation with -3. Now, let's simplify this equation. (-3)^2 square, is the same as -3, multiply by -3, which equals to 9. Let's write this back here. 9 minus 4, gives 5. Hence, we get y equals to 5. Now, let's fill in this box with 5. With this, we have a point with the coordinates (-3, 5). This point is located right over here. Let's calculate the next point. Substituting x, with --2. (-2)^2 is the same as -2, multiply by -2, which is equals to 4. Let's write this number here. Next, 4 subtract by 4, gives 0. Hence, we have y equals to 0. Now, we can write the number 0, here. By doing so, we get a point with the coordinates (-2, 0). This point is located right over here. To find the next point, we repeat the same steps as before. Substitute x in this equation with -1. Simplifying (-1)^2, gives 1. 1 minus 4 gives, -3. Hence, we have y equals to -3. Now, let's fill in this box with -3. With this, we have a point with the coordinate (-1, -3), and this point is located right over here. Now, by repeating the same steps for the rest of the x-coordinates, we will have all the y coordinates. The point with the coordinates (0, -4) is located here. Next, the point with the coordinates (1, -3) is located here. Again, the point with the coordinates (2, 0) is located here. Finally, the point with the coordinates (3, 5) is located here. That is all for this lesson. In the next lesson, we will learn about the vertex of a quadratic graph. In this lesson, we will learn another way for graphing quadratic equations. Consider this quadratic equation, y = -x^2+2x+4. First, we need a table to record the coordinates of the points that we are going to calculate. Since the x-coordinates are not given in this table, we need a way to get them. To do so, we can use the formula for the x-coordinate of the vertex of a quadratic equation, x = -b/2a. To find the values of 'a' and ‘b', we can compare this equation with the general quadratic equation, y = ax^2 + bx +c. For easier comparison, we can rewrite this equation as, y = -1x^2 +2x +4. By comparing, we have, a=-1, b=2, and c=4. Knowing this, we can substitute 'a' with -1, and substitute 'b' with 2. Let's simplify this term. Now, this term is the same as, -2/2(-1). 2 multiply by -1, gives -2. -2 divides by -2, gives 1. Hence, we have, x=1. Let's write this down here. With this, we know that we have a point with the x-coordinate of 1, and this point is located at the middle of the graph. Keeping this in mind, we can pick the rest of the x-coordinates, by taking three x-coordinates smaller than 1, which are, 0, -1, -2. And take three x-coordinates greater than 1, which are 2, 3, and 4. Let's change back to the original equation. With all the x-coordinates, we can now use this equation to calculate the y-coordinates. Here’s how. When the x-coordinate is -2, we can substitute x in this term with -2. Similarly, we can substitute x in this term with -2. Let's calculate for y. 2 multiply with -2, gives -4. -4 and +4, cancels off each other. (-2)^2, is the same as, -2 multiply by -2. which is equals to 4. Let's write this down here. So now, we have, y equals to -4. Let's write it here. We can perform the same steps to find the rest of the y-coordinates. After doing so, the table will be filled with numbers as shown. Alright, let's put these points on the graph. The point (-2, -4) is located here. The point (-1, 1) is located here. The point (0, 4) is located here. Now, we repeat the same steps with the rest of the coordinates, and we will have all the points in placed, as seen on the graph. Finally, we draw a curve to join these points together, as shown. This is the graph of y=-x^2+2x+4. You can start by going through the series of questions on graphing quadratic equations or pick your choice of question below.